Suppose you are asked to add a combo box (drop down) in your sheet and pull values from a range based on selection in the combo box (drop down). Check if Developer tab is enabled. 2. On the Developer tab, in the Controls group, click Insert, and then under Form Controls, click Combo box Button. 3. Click on the cell(s) where you want the drop down to appear. 4. To display the text box, drag the left-center sizing handle to the right. 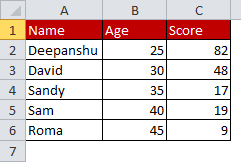 Enter data into column A to C.
Task : Filter data based on column A values listed in drop down. In the Input range: enter A2:A6 (values to display in the drop-down list). In the Cell link:, enter D1 (cell reference that tells you which value is selected in the drop-down list). Press ALT + F11 to open VBA editor window. Next Step : Right Click on the drop down and click Assign Macro and select FilterData and then click OK.
8 Responses to "Excel VBA : Filter data based on drop down selection"
Thank you for this example! Is there a way to do it so that you can erase the previously copied data with the new data based on a new selection?